So, on August the first, we went to pick up Hannah, Mark, and Achi at the airport as they had gone to the beach for Hannah's birthday. Their flight was horrendously late, though, so we had to wait at a coffee shop so that the kids would be comfortable somehow. Sam did enjoy picking out items on the menu with his Granny. From the airport to Sambokojin on EDSA (I normally go to the one in Eastwood), it was an agitating trip. The traffic was moving as slowly as molasses, and we were afraid that we wouldn't get to the place before closing time; but get there we did, although the choices were not as good anymore. Still, it looks to me that everyone had a good time. Sam and his papa talking about what to eat? Achi making usi. Dad and Mom pose in between bites. 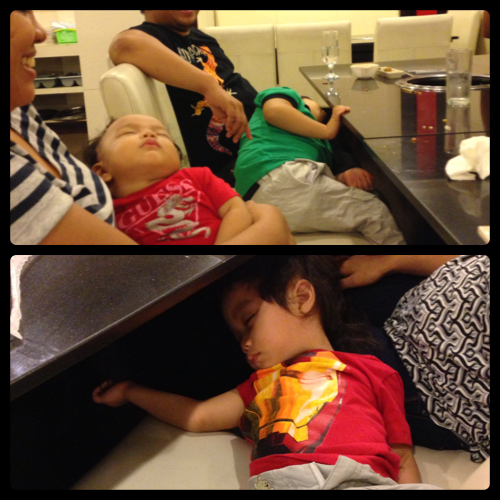 The kids were just so tired, they conked out! I think we need to do a repeat; earlier and with less hurrying about.